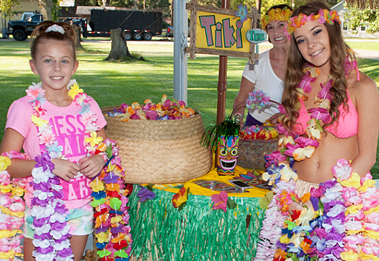 The tiki god granted everyone’s wish for perfect weather at the second annual “Escape to the Tropics - Island LuWow” FOR fundraiser party on Sat Oct 3rd. The event was held on the east bank of the San Bernard River, which, after a libation or two, could be imaged as the warm, crystal clear tropical waters of an island paradise. 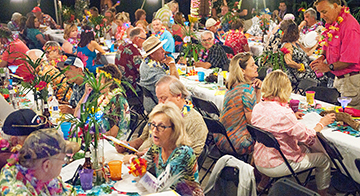 After a dinner of roasted pig, chicken, polynesian rice, yams, corn on the cob, pina colada cake and fresh fruit, a live auction was held with Jarrod Smith as the auctioneer. Dancing to the music of the Buster Curry Band closed out the evening. FOR San Bernard thanks all of the sponsors and friends for their generous support and participation. FOR will continue to pursue its mission of stewardship for the San Bernard River watershed by continuing to offer programs such as river and road cleanups, River Ranger 5th grade watershed education, environmental education presentations, scholarships, advocating for opening the river mouth, and conservation easement. A colorfully dressed crowd of nearly two hundred attended the event. 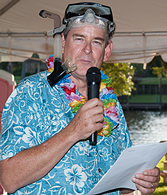 FOR president Tom Ronayne, wearing his still damp scuba gear, was the master of ceremony for the evening. Roasted pig on the menu! 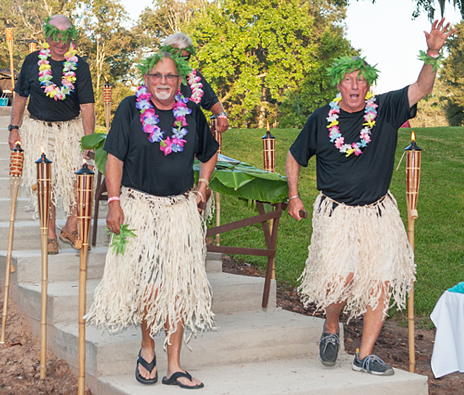 Pig presenters, Ken Wright, top left, Bob Bailey, hidden, Gary Kersh, left, and Charlie Pogue carry the roast pig to the serving table signaling the start of the "Escape to the Tropics - Island LuWow" fundraiser . Linda Wright clangs the gong announcing the presentation of the roasted pig.